Presto supports Samsung’s Note and Tab devices, and Nexus tablets with 7-inch screens or larger. Foxtel’s movie streaming subsidiary Presto can now be viewed on big-screen televisions following support for Google’s Chromecast dongle. Presto pledged support for Google’s Chromecast when the dongle was launched at the end of May. Today the Foxtel subsidiary has kept its commitment by making it possible to stream Presto from select Android tablets, iPads and PCs to Chromecast equipped televisions. 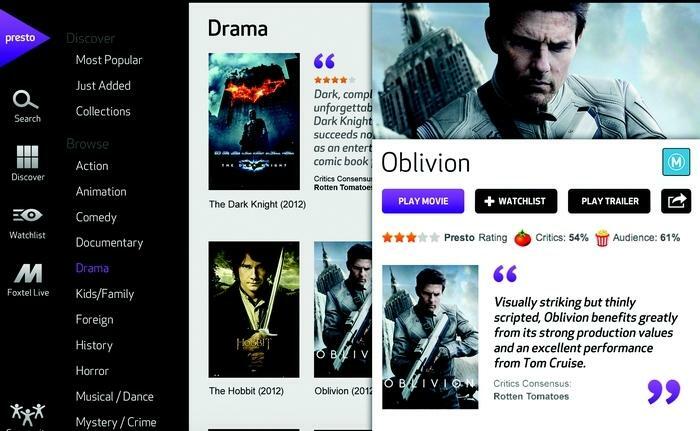 The video-on-demand company also announced support for select Android tablets. Only a handful of Android tablets are supported due to lingering piracy concerns; an issue shared by Foxtel’s Go application. Presto is offering one month free access to customers who purchased the Chromecast from its local launch on 28 May. Subscribers to News Corp publications The Daily Telegraph, Herald Sun, The Courier-Mail and The Advertiser will be eligible for two free months. Presto grants access to eight Foxtel movie channels in standard 576i definition from $20 per month. Movies can be streamed over cellular 3G connections or home Wi-Fi networks.